Photo: Tim and Kate from the United States of America visited Nevis for the first time and toured the Botanic Gardens June 27. 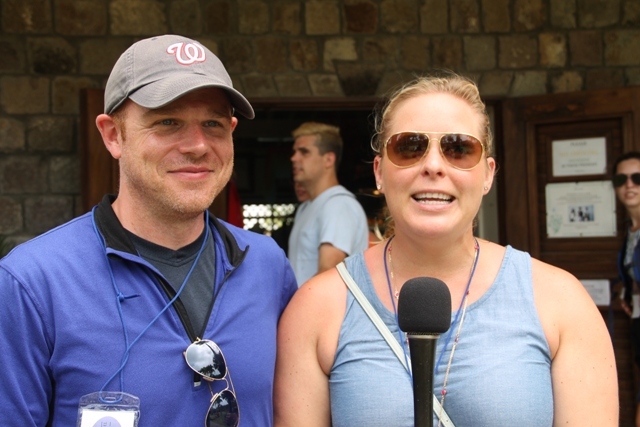 CHARLESTOWN, Nevis – A couple from the United States of America visited Nevis for the first time and say they are captivated by the island and its people. Tim from Washington D.C. and Katy from Rhode Island left Nevis on June 29 after a six-day visit. They were guests at the Four Seasons Resort and say they discovered Nevis through friends who recommended the destination. The Department of Information met them while on a tour of the Botanic Gardens on June 27 and they consented to speak of their experience on the island. Tim noted that although he has a few favourites, the Nevis Peak topped the list. “I have to say that my favourite part of the island is actually just looking up at Mount Nevis and seeing it shrouded,” he said. “It’s absolutely magnificent… I would absolutely come back to Nevis. It is absolutely gorgeous and I would recommend it to all my friends. This is a gorgeous place. Tim stated that they had been posting photographs of Nevis on Facebook and the response from their friends has been overwhelming and have all expressed interest in visiting the island. An excited Katy echoed similar sentiments of her boyfriend and described her visit as an incredible and spectacular experience.